The future of the first rural college of the state and its 3,000 students is under threat with the Panjab University Syndicate taking up an inquiry report that states Sri Guru Gobind Singh Khalsa College, Mahilpur, is an ‘institution with buildings, furniture but no academic feature’, and thus not fit for affiliation. Punjab Deputy Chief Minister Sukhbir Singh Badal's visit to the city today focused on "Punjab Shining". Sukhbir said that in the next couple of years, the state would witness a transformation in terms of infrastructure. 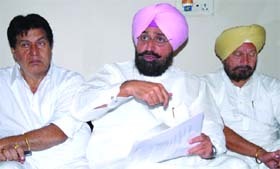 Pradesh Congress Committee president Partap Singh Bajwa has asserted that even as Punjab is undergoing a severe financial crisis the SAD leadership is misleading the people by claiming that the state’s economy has not gone awry. Finally, waking up to the need of spreading awareness about Sikhism on foreign shores, the SGPC has decided to set up a Sikh mission on 14 acres of land in California, US. Gurdwara Kandh Sahib, seeped in a rich tapestry of Sikh history and culture because of its pious connection Guru Nanak Dev, was the cynosure of a million eyes as devotees thronged the place to pay obeisance on the occasion of the 526th marriage anniversary of the Guru. Dal Khalsa's youth wing Sikh Youth of Punjab (SYP) has said it agrees with the observation by former Director- General of Police (Prisons) Shashi Kant that the drug racket in the state is not short of a “systematic genocide” orchestrated by drug peddlers and their “protectors sitting in the government at all levels”. At 85, Chief Minister Parkash Singh Badal remains his party's foot soldier, regularly visiting flood-affected areas in the Malwa belt. In a case of rivalry during the recently concluded panchayat elections, a newly elected Akali sarpanch allegedly fired at his political rivals at Sandhalpura village today, injuring four of them. The Punjab Information Commission has asked the Secretary, Department of Local Governments, to review the existing mechanism of appointing Public Information Officers (PIOs) since it found the arrangement between PIOs and staff to be confusing. The Punjab School Education Board office was today flooded with complaints that papers of the online examination, scheduled to be held for Class VI to Class X from tomorrow, were leaked. Officials termed these complaints as rumours. The two-and-a-half-year-old Ludhiana girl, who was gangraped on Tuesday, is now learnt to be stable. She underwent a surgery at the PGIMER here on Wednesday. The Indian Railway Catering and Tourism Corporation (IRCTC) will ply a special package train from Amritsar to Madgaon (Goa) from September 15. As per the schedule, the train number 12484 will depart from the Amritsar railway station at 5:55 am on September 15 and reach Madgaon on September 16 at 10 pm. The return journey will start on September 19 at 1:00 am. The train will reach Amritsar on September 20 at 10:00 pm. Former Chief Minister Amarinder Singh appeared in a court here today in connection with the Amritsar Improvement Trust land scam case. The next date of hearing was fixed for September 24. Alert BSF jawans foiled an attempt by Pakistan-based smugglers to push contraband, arms and ammunition into the Indian side near the border outpost of Rattoke in Khemkaran (Tarn Taran) by engaging them in an encounter late last night. Rivalry between Satguru Uday Singh and Thakur Dalip Singh today deepened further after two aides of the latter Navtej Singh, president of International Namdhari Sangat, and Bachittar Singh Namdhari were booked under the Information Technology (IT) Act for allegedly writing objectionable comments against the Satguru and Mata Chand Kaur (former Satguru Jagjit Singh’s wife). Continuing its crackdown on the sand mafia, the police has arrested eight persons and seized 10 loaded trucks and 5 trailers in the last 24 hours in separate raids in the district. Also known as Asia’s nursery of soccer and the running champion of PU A Division Football for 20 years, the legendary co-education college has been brought to this pass by the machinations of one man, its Principal, Surjit Singh Randhawa. The man has successfully survived at least half a dozen indictments in various inquiries over a decade, including on the charges of fraud, forgery and embezzlement. The latest jolt came, ironically, after the college sought the status of an autonomous college from PU, and when denied, moved the High Court. The High Court has issued notices to various respondents, but refused to allow the college to begin admissions as an autonomous institute. A PU inquiry conducted by a committee constituted by the Vice-Chancellor on July 17 following High Court orders found that the college was not fit even for simple affiliation from the university. 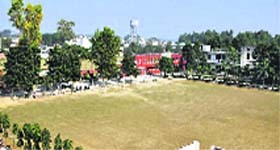 Sri Guru Gobind Singh Khalsa College, Mahilpur, had in its history of over six decades earned much respect in sports, often referred to as the football nursery of Asia. Legendary footballer Jarnail Singh (Arjuna Awadee) and Gurdev Singh Gill (Arjuna Awadee) were the glorious products of this college. The football team (men) of the college has been winning the Panjab University A Division Football Championship for the past 20 years. The women’s team too had won the championship. Krishan Kumar, then Director-General, Punjab School Education, had held Randhawa guilty of drawing salary from 1990 to 2002 as a Punjabi teacher on the rolls of Government Middle School, Mahima Chak, and producing an experience certificate as lecturer for the same period at SGGS Khalsa College, Mahilpur, to get appointment as Principal in the college in 2002. Randhawa had been drawing salary from two places. A PU Inspection Committee in a report dated July 19, 2013, found Randhawa had bypassed the College Management Committee to apply for autonomous status for the college on the basis of a ‘fabricated document’, signed by Ajit Singh, an office Superintendent, showing him ‘maliciously’ as general secretary of College Management. Dr Jangbahadur Singh was the actual general secretary, with whom the committee had interacted. Observing ‘serious deficiencies, in the functioning of the college, the committee ‘strongly recommended’ that autonomous status not be granted to the college. A VK Sibbal Report, accepted by the PU Syndicate on August 13, 2013, found Randhawa got recognition to start an MPEd College on the basis of fabricated documents relating to the faculty. One Dr Daljinder Singh, shown appointed as Reader, submitted in writing that he had never appeared before a selection committee nor ever visited the college. Appointments of three other teachers, Pritam Singh, Swinder Singh and Gurmej Singh, were also bogus. So much so, photos of Avtar Singh, Ajit Singh and Sardool Singh, respectively, had been pasted on their appointment letters. The then SP, Una (HP), in a letter dated June 17, 2006, had sought the help of the PU Vice-Chancellor and Hoshiarpur SP to secure the arrest of Randhawa, who had been booked in a criminal case registered at Haroli, Una, on the charge of firing shots at a check post at Ajauli. Randhawa was later bailed out in the case. The PU has also ordered a commission of inquiry headed by Justice Garg (retd) to probe three different complaints against Randhawa regarding misappropriation of UGC grants worth Rs 30 lakh, Rs 36.50 lakh and Rs 42.30 lakh. The inquiry is currently in progress. Same piece of land shown to seek affiliation for multiple colleges: The well developed campus - duly registered with Revenue Department - was shown as vacant and non-agricultural land in various affidavits, on the basis of which recognition was obtained from PU and NCTE, Jaipur, for starting a self-financed BEd college in 2006 and a Teacher Training Programme in BPEd in 2007, MPEd in 2008 and CPEd in 2009. As per norms, a separate campus is required for each college. The Principal purchased a luxury Skoda car for Rs 11.4 lakh in February, 2010, out of a UGC grant, withdrawn from the Principal’s account in Punjab National Bank at Mahilpur. As many as 17 employees and teachers who retired from the college have not been paid their full dues. Many are running from pillar to post to get what is their right. Principal Surjit Singh Randhawa, when contacted by The Tribune, defended all his actions. The land belongs to the Sikh Education Council, Mahilpur [to which he has transferred college land]. It can do anything with the land. If we are expanding and getting more courses for students, why should anyone object? Moreover, only 135 kanal and 6 marlas of land was transferred to the council. The college has the rest of the land with it. Development projects, including six-laning of roads, and industrialisation would be the priority list, he said. The state government would spend a sum of Rs 3,000 crore on Ludhiana's development. For other cities too the masterplan was ready and these would witness unprecedented development in three years, the Deputy CM said. The state would become the best investment option soon with the state becoming power surplus in a year. Blaming the economic policies of the Congress-led UPA Government at the Centre for the country's fiscal problems, Sukhbir claimed that the Congress was losing base across the states. He accused the Congress of using Central agencies to coerce its political opponents. The Deputy CM announced that beginning October 15, clearances for establishing new colonies would be given online to facilitate colonisers and house-holders. He said he had directed PUDA as well as the Housing Department to come out with an online portal before the first week of October to provide online clearances, including CLU and map certification. Sukhbir was in the city to preside over a felicitation programme organised by the Punjab Colonisers and Property Dealers' Association. Among those present were Punjab BJP chief Kamal Sharma, Revenue Minister Bikram Singh Majithia, Adviser to CM Maheshinder Singh Grewal, and vice-chairman of the Punjab Planning Commission Rajinder Bhandari. Meanwhile, former District Youth Congress (Urban) chief Dimple Rana, along with other local Congress and BSP leaders, including Jagdish Singh Jassowal, and office-bearers of various industry associations, joined the SAD at a party function attended by the Deputy CM here today. “SAD chief Sukhbir Badal’s claims indicate that the Punjab’s economy is in the pink of health whereas the ground reality is entirely different. The government owes more than Rs 2,800 crore to its employees alone. Of this amount, salary arrears account for Rs 1,000 crore and outstanding DA Rs 1,800 crore,” said Bajwa. Showing a copy of 66-page Punjab Government memorandum submitted to the 14th Finance Commission recently, Bajwa said the memorandum itself should be treated as a white paper on the state’s fiscal position wherein the government had admitted that the state’s economy was in bad shape. “The memorandum clearly states that the outstanding debt as a percentage of revenue receipts is close to 300 per cent. Interest payment as a percentage of revenue receipts is more than 20 per cent. Nearly, 90 per cent of the borrowings is used for debt servicing leaving only 10 per cent for development. Debt GSDP ratio is above 30 per cent. All these indicators highlight that Punjab is under a severe debt stress. “It is interesting that on September 7, the SAD pleads for a financial package before the finance panel citing its bad fiscal situation and two days later, Sukhbir claimed that the state’s economy is very much sound and growing robustly,” said Bajwa. He said even the claim that the SAD-BJP government never defaulted on the payment of salaries fell flat as salaries to the tune of Rs 250 crore for August was still pending. The PPCC president claimed that the government had even availed emergency provisions for raising funds like overdraft, and short-term advances. “Punjab was at number one position in 1997 in terms of per capita income. Now, we are at number nine. We are even lagging behind our poor cousins, Himachal and Haryana”. “We are not against the Union Government helping the state to bail it out from the financial mess. We only want that the funds so availed should be utilised in a transparent manner,” he added. The problem has become acute. Chief Minister Parkash Singh Badal, who belongs to Muktsar, has been camping in the area for the past four days. Chief Executive Officer of the National Rainfed Area Authority Dr JS Samra, one of the members of the central team, said there was an immediate need to rectify the alignment of drains.These drains had been laid to remove water but had now turned counter-productive. Instead of draining out water, these had become a source of waterlogging. "We will submit a report to the Chief Minister by the end of next week. Steps required to be taken to deal with the problem have been discussed with the authorities concerned," said Dr Samra who stayed in Muktsar for three days. He was accompanied by former Chairman of the Central Water Commission Rajesh Kumar. Dr Samra said said technically water from villages and fields should naturally flow into the drainage system. However, this was not happening. At most of the places, water had to be pumped out with the help of diesel sets and thrown into the drains. Another factor contributing to the problem was excessive irrigation. Easy availability of canal water had led to flood irrigation and this had raised the level of subsoil water over the years. "I would say that excessive water allowance, a technical term for allocation of quantity of water to acreage of land from a canal outlet, is responsible for waterlogging in the area," Dr Samra maintained. "During 1950-60, the subsoil water level was 150 ft. It was now about 5 ft, leaving no scope for the surface rainwater to seep into the soil," explained the expert. He said a bowl-like tract had been created beneath the subsoil in Muktsar and water had accumulated in that tract. Also, there had been seepage from nearby canals, Sirhind Feeder and Rajasthan feeder, which had added to the problem, he said. He said paddy cultivation in the area must be discouraged and aquaculture promoted instead. The recommendation to drastically cut canal water allowance is not likely to be accepted by the state government. Canal water is a touchy issue and the government will have to think twice before taking any decision in this regard. The SGPC move comes within days of a survey by Sikh American Legal Defence and Education Fund (SALDEF) and Stanford University that 49 per cent Americans believe “Sikhism” is a sect of Islam. Talking to The Tribune, SGPC chief Avtar Singh Makkar said a four-member delegation headed by him would leave for the US on September 25 to carry forward the process for establishing the Sikh mission there. He said the land documents were ready. He said the main aim behind the mission was propagation of Sikhism and building up a supply line for sending Sikh literature abroad, besides ensuring visits of 'ragis' and preachers to foreign countries. He said they also planned to educate NRIs' children on Sikh tradition and culture and the Punjabi language. The mission would play a key role in redressing various issues faced by the US Sikhs on account of mistaken identity and security barriers. The SGPC planned to form a team of research scholars to prepare a multi-lingual literature to spread awareness on the Sikh religion. This is not the first attempt by the SGPC to set up a Sikh mission in the US. It had earlier planned to take over a gurdwara in the US, which was facing a financial crisis, and house the mission there. However, this could not materialise. The SGPC had tried to set up a printing facility for Guru Granth Sahib in North Carolina, US, with Gurdwara Sahib Charlotte offering it 2.5 acres of land for the purpose. However, there could be no headway. The project, with an estimated cost of Rs 5 crore, would have been the first such facility outside India. Meanwhile, radical Sikh outfit Dal Khalsa has welcomed the SGPC move to set up the mission in the US. Party leader Kanwar Pal Singh said the SGPC had finally responded to the long-pending demand of the Sikhs. He said the SGPC should hire the services of learned Sikhs abroad to help dispel wrong notions on the Sikh identity. Referring to a survey, he said it was ironic that in India, Sikhs were being clubbed as “part of the Hindu religion” whereas in the eyes of Western people, they were being viewed as a “sect of Islam”. Among the devotees was 100-year-old Nand Singh who travelled from Dala village in Gurdaspur district to be part of the sacred event. He stood in the serpentine queue for four hours, was heckled and jostled by the crowd, but he kept his nerve. “Keep calm and praise the Guru,” was what he kept on saying till he managed to pay obeisance at the gurdwara. 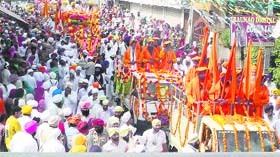 Sources said nearly two lakh pilgrims took part in the festivities which over the years had earned the sobriquet of “Babe da viah”. Batala Sub-Divisional Magistrate JS Grewal coordinated with senior officers of the Batala police to ensure that no untoward incident took place. SSP SS Mand said the town had been divided into seven zones with each zone being looked after by a DSP-rank officer. Pickpockets had a difficult day as the district administration had installed CCTV cameras at various strategic points. In his petition to the Punjab and Haryana High Court, Shashi Kant has said that several politicians from various parties run “the racket”, either directly or through henchmen, in connivance with the police. In a press note today, SYP chief Ranbir Singh, vice-president Paramjit Singh and general secretary Manjit Singh hit out at political parties of all shades for their "casual" approach towards the drug menace. On the state government’s denial that it had not received any list of politicians and police officers involved in drug smuggling by Shashi Kant during his tenure as intelligence chief, the leaders urged the retired officer to reveal the names of all those involved in drug trafficking. “We have heard that you had prepared a report with names of politicians and black sheep in the police. What stops you from exposing such bad elements," they asked. Several young leaders including his son Deputy Chief Minister Sukhbir Singh Badal, has not visited the suffering people even once while the octogenarian Chief Minister has brought the state machinery to the doorstep of the affected villagers. Many are yet to get relief and there is anger against other SAD leaders for leaving the matter to the aged Badal. Though Punjab Pradesh Congress Committee president Partap Singh Bajwa and Congress Legislature Party (CLP) leader Sunil Jakhar have toured the affected areas, residents said they expected leaders from the ruling party to came forward to help them at this juncture. After the flood fury in mid-August, Badal has spent nearly two weeks in different parts of Malwa. His presence has kept both district and state-level officials on their toes. 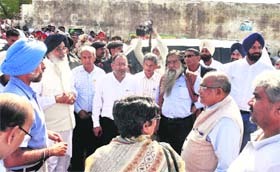 Bathinda legislator Harsimrat Kaur Badal and Cabinet Minister Bikramjit Singh Majithia has accompanied the Chief Minister to the affected Muktsar areas only once. 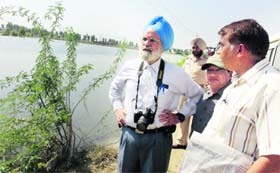 Irrigation Minister Janmeja Singh Sekhon has visited Ferozepur and not Muktsar, which is the worst-affected. Badal has camped in Muktsar district for a week. Tongues are wagging as to why the Deputy Chief Minister, who has a fleet of helicopters at his disposal, has not yet visited the flood-hit areas. 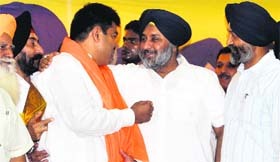 Accused Harpal Singh was engaged in a bitter rivalry with Ajaib Singh, who had contested against him for the post of sarpanch. He fired several rounds at Ajaib Singh and his three accomplices. All the four injured have been admitted to the Batala Civil Hospital. Interestingly, the police has not yet registered an FIR. SS Mand, Senior Superintendent of Police (SSP), Batala, said the police was busy in security arrangements for "Babe da viah" celebrations at Gurdwara Kandh Sahib today. "We will take up the case tomorrow and arrest the accused sarpanch soon," he added. Abhinav Trikha, Gurdaspur Deputy Commissioner, directed the SSP to take steps to arrest the accused. In the case of Kuldeep Singh Khaira of the Vigilance Citizen Forum (Ludhiana), the appellant pointed out that “instead of designating senior officers as PIOs as per the government notification, junior officers had been appointed on the posts”. Importantly, instructions ‘to streamline’ the rather peculiar structure of the MC were issued in April. “This Commission has observed that in most of the cases, delay occurred in providing information due to confusing arrangement amongst the designated PIOs and the staff,” the order said. In a separate order, the Information Commission had directed the commissioner of Ludhiana MC to recover Rs 25,000 from the salary of PIO Dharam Singh in a case of delayed information on construction of footpaths on Gill Road. In another case, the commission, had levied a penalty of Rs 25,000 on Raj Kumar, the PIO in an appeal filed by another Ludhiana resident, Rohit Sabharwal. It sought action against Raj Kumar on account of providing a very poor response to Sabharwal’s query, causing “inconvenience and mental agony”. Raj Kumar would also have to pay a separate penalty of Rs 5,000 to the complainant. Students of these classes are to be evaluated through papers that will be sent online for subjects of mathematics, science, Punjabi, Hindi, English and social sciences. Instead of rubbishing reports of paper leaks, the department should look into the issue. There are other issues too. Since computers at many schools are not working, papers could not be downloaded. However, her father has been struggling to bear the expenses of her treatment. He is a labourer. He claimed that his life’s savings were stolen by the rapists. “The doctors say my child is now out of danger. But, she needs to be under observation here for a few more days. I do not have any money left, I don’t know how will I manage,” said the child’s father Mohammad Raju. A team of police officials visited the PGIMER to monitor the child’s condition and proceed with the investigations. The girl was abducted by two persons early morning on Tuesday and was found bleeding on the roadside in the afternoon, said the police. The PGIMER doctors confirmed she had sustained grievous injuries and needed extra care. The police said several people had been rounded up as of now. RK Sondh, IRCTC chief regional manager, said the special package included stay and site seeing arrangements for the passengers. The fare would be Rs 10,500 for single person, Rs 8,650 each for double booking and Rs 8,450 each for three bookings. Official said the package included visit to Dona Paula, Miramar beach, old Goa churches, Mangeshi temple, Shantadurga temple etc. Officials said the special train was being started on the demand of the passengers and they were expecting 100 per cent reservation. Capt Amarinder Singh, Chaudhary Jagjit Singh, former minister, and others had been booked in 2008 under various sections of the IPC and the Prevention of Corruption Act. Chaudhary Jagjit Singh also appeared in the court today. Later, while talking to mediapersons, Capt Amarinder Singh said that a “jan sampark” campaign would be launched soon by the Congress to give a tough fight to the SAD-BJP combine during the general election. He said the poll was likely to be held in May next year. In reply to a question, the former Chief Minister said Partap Singh Bajwa was the president of the Punjab Pradesh Congress Committee while he (Capt) was a member of the AICC. Amarinder Singh further said the government treasury was never empty during Congress rule in Punjab. Now, salaries were not being given on time and people had to wait for a long time even for old age and widow pensions and benefits under the Shagun scheme. A Division Bench of the High Court has set up a six-month deadline for the purpose. It has set aside its own directions to the doctors to submit medical reports through affidavit in “clear terms with correct spelling”. In a first, the Bench of Justice Hemant Gupta and Justice Fateh Deep Singh has, in fact, issued 10 commandments, while taking up an appeal filed by the State of Punjab against Mohinder Singh. The Bench has made it clear that the court would organise two-way or three-way video conferencing among the court, the medical expert and the jail, if the accused is in custody. The public prosecutor in criminal cases, advocate for claimant in accident cases, or any other counsel wishing to examine a medical expert would disclose the place of posting of the doctor concerned, along with his e-mail ID or contact number. The photocopies or the soft copies of the documents to be proved by examining the medical expert would be forwarded to him. The court would allow preparation of photocopies of relevant documents, if these were unavailable. If such documents were in possession of a third person or party, a simultaneous direction would be issued by the court requiring him to make these available in the court at the time of video conferencing. The court concerned would fix a date “before which the examination-in-chief would be furnished by the medical expert” to the court. It would, in turn, fix a date for cross-examination “giving tentative time slot for video conferencing until mechanism of booking of slots is put in place”. The doctor would confirm his availability. The Bench added the medical experts may go to the district court, the DC office or the NIC office, till the establishment of studios in civil hospitals. The directions would be applicable to the medical experts posted away the place of court sitting and “shall not preclude the court in appropriate cases to record evidence of the medical experts in court”. The BSF authorities seized 13 packets of heroin worth Rs 65 crore on the black market, two hand grenades, a pistol and two magazines from the site. The smugglers managed to flee. 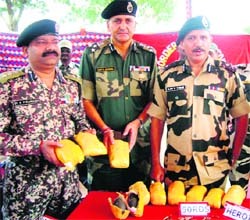 It is the first time in the past two decades that hand grenades have been seized by the BSF. This has baffled the BSF as well as intelligence agencies that have launched investigations to determine to whom the consignment was to be delivered. Giving details of the incident, Tomar said at 1.30 am, troops noticed suspicious movement in paddy fields across the fence. The jawans challenged the intruders who opened fire. The jawans retaliated firing 13 rounds. The smugglers fled, leaving behind a 12-ft-long plastic pipe with 14 packets containing the contraband and arms. The case has been registered on the complaint of Surinder Singh Namdhari, vice-chairman, Kuka Martyrs Memorial Trust, and vice-president, Namdhari Darbar. Kuwar Vijay Partap, DIG, Cyber Crime, Mohali, had conducted an inquiry into the matter and found substance in the charge that social networking sites had been misused for hurting religious sentiments of a particular sect. Even some fake IDs were created to malign the image of Satguru Uday Singh and Mata Chand Kaur. Objectionable and doctored clippings, both audio and video of Satguru Uday Singh and Mata Chand Kaur were uploaded on the website. In his complaint to the police, Surinder Singh alleged that Navtej Singh and Bachittar Singh could have orchestrated the attack on the Satguru as information about it was uploaded on the website four days prior to the incident. Senior Superintendent of Police KJS Dhillon said the police had launched an operation against the sand mafia engaged in illegal mining on the Sutlej basin. In the last two weeks, the police has registered 15 cases under section 379 of the Indian Penal Code and relevant sections of the Mines and Minerals (Regulation and Development) Act 1957 in various police stations. Yesterday, the police seized 10 trucks and four trailers loaded with sand illegally extracted from Ferozewala Bada village in Dharamkot sub-division and held six persons while eight others managed to escape, said Assistant Sub-Inspector Palwinder Singh who is investigating the case. One trailer was seized from the outskirts of Budhsinghwala village yesterday. Two persons were arrested on the spot. On September 9, a trailer of sand was seized from Kamalke village in Dharamkot sub-division while on September 8, seven persons were arrested from different places in the district. As many as five trailers and two trucks loaded with sand were seized. On September 7, six persons were arrested and as many trailers loaded with sand seized from their possession at Bhinder Kalan village in Dharamkot sub-division. Preliminary investigations in most of the cases suggest that the seized trucks and trailers were loaded from villages under Zira sub-division of Ferozepur district and Dharamkot sub-division of Moga district. Most of the villages from where the sand was being extracted are located in the area bordering these two districts. A court ban on mining had led to a spurt in sand prices, which propelled smuggling of the commodity.